Discussion in 'RPG Maker MV' started by Yawgmoth, Jan 14, 2019. In my game I have a class that has a skill that adds a special state. I want that state to cause a 10% increase of max HP whenever an enemy dies. I am using Yanfly's Buff and State Core Plugin to control stacking to a max of 5 times. I just can't seem to get a foot hold on this issue. I believe this can all be done using only states but perhaps I am wrong. I would prefer not to use troop events if it can be helped. Any help or suggestions would be greatly appreciated. Thank you all in advance. EDIT: For the most up-to-date version of the Plugin I wrote in this post, see this thread. I've written a Plugin that will run common events after any Actor or Enemy dies. If you want to use it, make sure you save it as "DeathCommonEvent.js". You can also download it from this post. 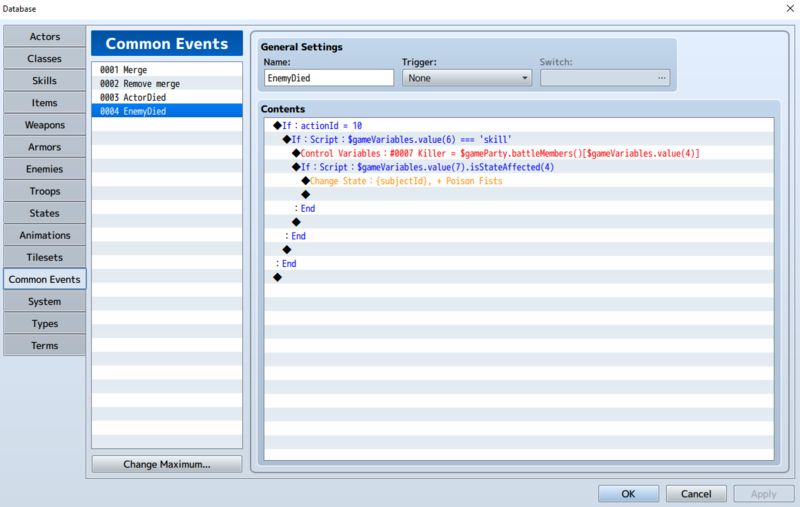 * @plugindesc This plugin will call a common event whenever any Actor or Enemy dies. 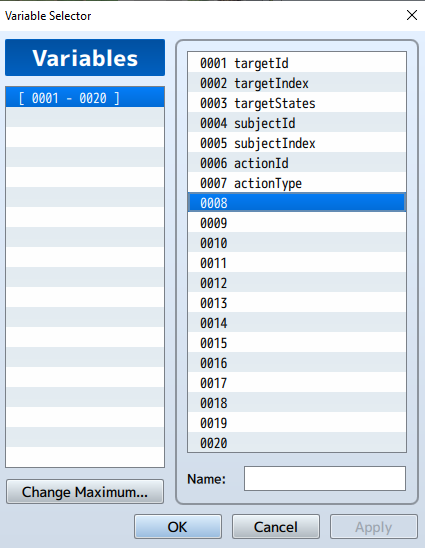 * variable (6 by default) to check if actionId is 4 and actionType is "skill". * before the victory logic is processed, then turn Run At Battle End ON. * previous Scene, turn Run At Battle End OFF and turn ON Run After Battle End. * battle dies, turn Run At Battle End AND Run After Battle End OFF. * @desc The ID of the common event to call whenever an Actor dies. * @desc The ID of the common events to call whenever an Enemy dies. * @desc The variable used to store the ID of the battler that just died. * @desc The variable used to store the index in the battle party or troop of the battler that just died. * @desc The variable used to store the list of states of the battler just before they died. * @desc The variable used to store the ID of the battler that just acted. * @desc The variable used to store the index in the battle party or troop of the battler that just acted. * @desc The variable used to store the ID of the last skill or item used before the battler died. * @desc The variable used to store the type of the last action used. Values are "skill" or "item". * @desc Whether the death common events should be run when the last Enemy or Actor dies, before victory is processed. * @desc Whether the death common events should be run when the last Enemy or Actor dies, after the battle is over. 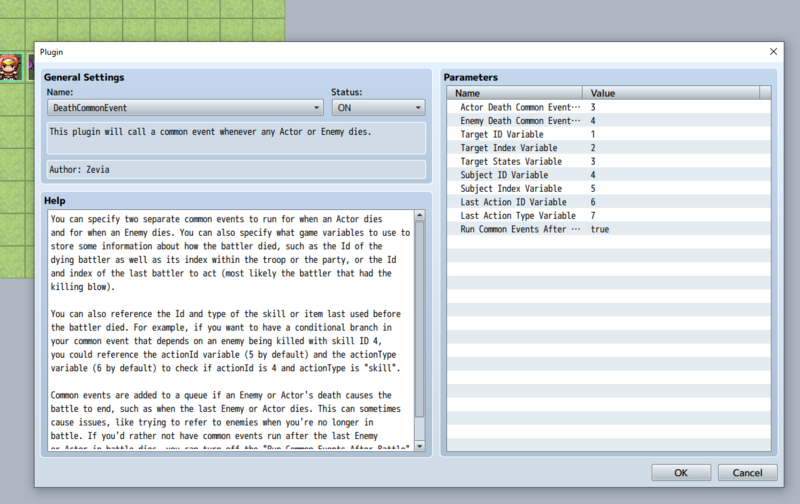 The plugin includes some logic to assign values to game variables that may be useful when writing common events, such as the Id and index of the last battler to act, the Id and index of the battler that just died, and the Id and type of the last skill or item used. By default, the Id of the Actor or Enemy that died is variable 1, the index in either battleMembers or gameTroop is variable 2, the Id of the last Actor or Enemy to act is variable 3, the index in either battleMembers or gameTroop is variable 4, the Id of the last skill or item used is variable 5, and the type of the last action ("skill" or "item") is variable 6. A quirk of common events is that their execution is queued up instead of immediately executed, so if you kill the last Enemy in a troop, the victory logic will process before the common event and your state would be applied outside of battle. If you don't want that to happen, you can either set your common event up to check if the current Scene is Scene_Battle, or you can configure the Plugin to not run on Actor or Enemy death if they are the last Actor or Enemy to die (basically, don't run on death if the death causes the battle to end). Wow well this looks great. My knowledge of script is very limited though. I downloaded the plugin. All I need is for my actors target state when applied to a foe to allow a state to be applied to my actor if my actor has the proper state on himself and the targeted for does. The foe can die in any way that part does not matter. If you can talk me through how to go about doing that along with how to set up the variables I would really appreciate it. Thank you for your quick reply. You'd have to store what states the enemy was affected by prior to being killed, since when the common event runs, the only state they'll have is 1 (knockout). I'll look into adding that information to the Plugin so that it's easily accessible without adding a bunch of common events to every skill that applies states or having to add troop events, then get back to you when I have some time to create a guide with screenshots. That would be great and thank you for helping. I look forward to your next post. I've modified the Plugin to now also store the state IDs a battler had just before they died as a game variable, as well, so you'll want to replace your version with the newest one. I've edited my post that has it, so you can either copy or download from there. In regards to game variables, when you use the "control variables" option in the event editor, you should reserve 7 variable slots that you aren't currently using somewhere. The reason is, this Plugin is going to frequently store values in them, so if you're using the ones the Plugin intends to use, you're going to get odd behavior. 1 - The Id of the Actor or Enemy that just died. 2 - The index of the Actor or Enemy that just died, referencing either the party's battle members or the current troop. For example, if you have a troop with Bat A and Bat B and Bat B dies, this value would be 1 (since Bat A is index 0). If you want to use the defaults, you could mark your variables using the "control variables" interface similar to below. 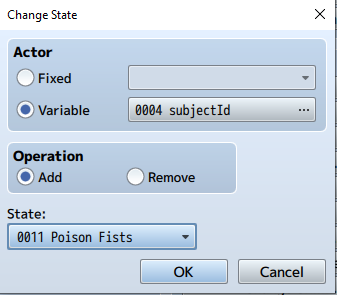 If you've already got variables in the 0001 - 0007 sections, then just use the Plugin parameters configuration to change them to something else. So for your common event, there are a few conditionals we want to write. Let's suppose that you want an actor to gain state 11 if the enemy had state 4 when it died and the actor had state 4 when the enemy died. Your first conditional would be, "Did the enemy have state 4 when it died?" But if you're using an older version, you'll have to use the indexOf check mentioned above. When you use indexOf on an array, if the array has the value, then you get back its index. If the array does not have it, you get -1.
replacing 4 with whatever the state ID is you want to check. Finally, we want to add a state to that actor - however, the default interface allows us to add states to actors referencing variables, so no script command necessary here! @Zevia Wow! You explained that very well! I think I have everything set up but will have to test it out tomorrow after work. I'll post back whether it works or doesn't. I am also using RPG Maker MV 1.6.1 and went with that specific script. I am using variables 91-97 since I had already used 1-7. My target state ID is 211. I'll post a screen shot below of my common event. Now I have a few questions if that is alright? 1. How is the common event called? 2. If I wanted to create another effect like this one could I use the same variables and change the evented state? No plans to do this. 3. In $gameParty.battleMembers()[$gameVariables.value(5)].isStateAffected(4) if I altered (4) to lets say a different state then the enemy, would the script then check the enemy for 4 and the actor for the the alteration? Would everything still work? Thank you for all this help! I really do appreciate it. I plan on doing a series of skills for a Ranger like character who hunts monsters. I wanted the character to get better as a battle progresses. I needed the character to have it's own unique thing and I think this will do the trick. I can't ait to play test. Please take a look at my common event .png below. The "die" method that gets called whenever a Game_Actor dies has been modified in the Plugin to call the common event with the ID matching the Plugin configuration parameter "Actor Death Common Event". The same is true for Game_Enemy calling the "Enemy Death Common Event" ID. 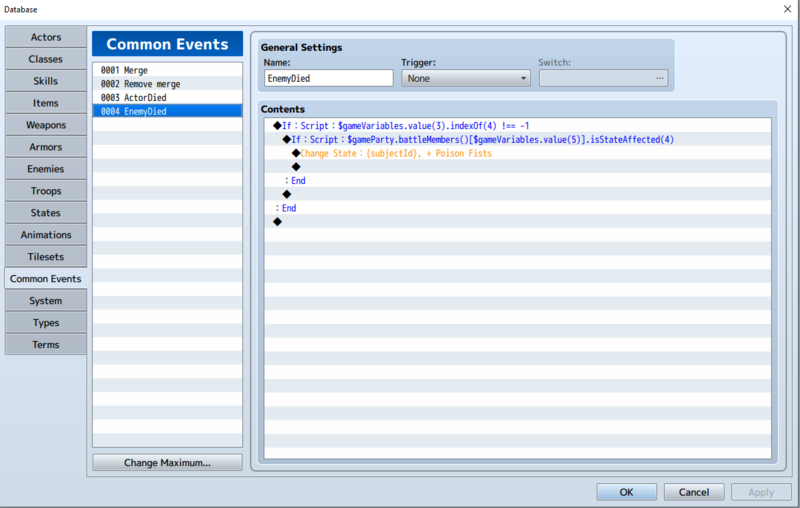 So, make sure you configure the Plugin parameters to set the "Enemy Death Common Event" value to 150. You'll also want to make sure the value for "Actor Death Common Event" isn't calling something you don't want to be called, so you'll want to change that value, too. Sure - if you want the same effect, but a different state to be applied, just change the state that gets applied. You should be able to make your common event do whatever you would normally do in a common event. Correct - they don't have to have the same state. So you could check if the enemy has state 4 and the actor has state 5. You don't even have to check states, if you don't want to - you could just see if an actor is wearing a particular item, or if they killed an enemy with a specific skill, or really whatever you might do in a common event. Please take a look at my common event .png below. Looks to me like your common event will check if the enemy that just died had state 211, if the actor that just acted has state 211, then apply the state "Consume" to the actor that just acted. That sounds correct. I'll make those changes in the plugin parameters and hopefully give it a test tomorrow evening. Thanks so much. EDIT: @Zevia I'm having some trouble locating the parameters you said need altered to common event 150. Could you maybe show a screen shot of the lines highlighted. I'm sure I'm just missing them. Thanks again. Ok, I think I may of figured it out. How does this look? * or Actor in battle dies, you can turn off the "Run Common Events After Battle"
* @desc Whether the death common events should be run when the last Enemy or Actor dies. If you go into your Plugin menu and double click on the Plugin, you should get another interface with a help window and available parameters. These parameters are handled via the comments you edited, but the idea is that a Plugin's author can make the Plugin configurable via the RMMV interface without having to edit the actual text of the Plugin. Well last night nothing had showed up when I had looked in the parameters so I had dismissed it as an option. However I just looked and all the parameters are there. I guess I altered it the hard way. LOL. Anyways here's a screen shot, I think everything looks good in the parameters from what you have said. I guess I am ready for a play test? EDIT: It seems like everything is working well during the play test. Thank you for all your help. This is a great plugin. If I have any further problems I'll let you know but I think I have it from here.